Decades ago, Shanduke McPhatter was one of the first groups of young men to join the infamous New York Bloods. But this weekend, he was the moving force behind a march against senseless gun violence in his neighborhood. McPhatter, founder and executive director of Gangstas Making Astronomical Community Changes Inc., a nonprofit he founded behind bars in 2008 and established after his release the following year to prevent youths from going down his former path, pleaded for an end to senseless killings. “I used to be the problem, but now, I’m a part of the solution,” he told demonstrators during the two mile-long march, which had about 200 youths, former gang members and community activists in crime-ridden East Flatbush, Brooklyn. 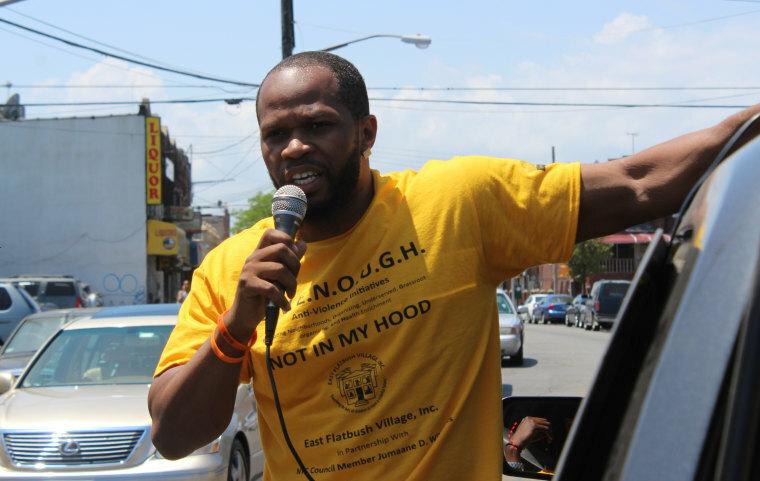 The “Not In My Hood” March kicked off the start to Gun Violence Awareness Month across the city, as the number of shootings and murders tend to increase when summer draws near. Mayor Bill de Blasio last week blamed street gangs for the spike. The latest statistics from the NYPD show that while overall crime is down, shootings and murders are up by seven and 15 percent, respectively. To combat this surge, NYPD top officials said Monday that 330 officers will leave administrative duties to hit the streets in high crime areas. This is part of the department’s ‘Summer All Out Program,’ which begins June 8. At the march, relatives like Maxine Lewis, whose 16-year-old son, Carlton Locksley Bennett died from a gunshot wound to the head 22 years ago, spoke out against street violence. She said Bennett was visiting relatives in the Bronx when unknown assailants shot and then robbed him for a gold chain.“Just like that. For a gold chain his life was cut short,” said Lewis, who told NBC that she survived a suicide attempt and was placed on medication to help recuperate. Bennett had helped lead Brooklyn’s Canarsie High School soccer team to championships and aspired to become a professional athlete, his mother recalled. To keep his memory alive, Lewis is proving educational programs and scholarships to engage at-risk youths through the Carlton Locksley Bennett Foundation she founded in 2011. Her next step is securing funds that would establish a multi-purpose center. “I want to engage kids who dropped out of high school,” she added. “They’re the ones who are on the streets. I want to pull [them] in. ”Demonstrators also used the action to urge the city to allocate more resources in poverty-stricken neighborhoods. They said this would help address "underlying issues" that are plaguing violent communities. City Councilman Jumaane Williams, co-chair of the council’s Gun Violence Task Force who organized the march, lauded the mayor's ‘Gun Violence Crisis Management System’ he launched last summer. The $12.7 million program provides funds and resources to anti-violence groups such as GMACC, where former gang members, called "violence interrupters," target the 14 neighborhoods that account for 51 percent of citywide shootings. He added that “violence interrupters” treat crime as a public health issue, a tactic that is working, McPhatter also stressed. Sharlene Stewart, whose 19-year-old son Nicholas Walton was killed last year by two bullets to the chest by unknown assailants, applauded this “proactive” approach. The march ended at the Flatbush Gardens Housing Projects, where a resource fair was arranged for youth job opportunities, summer programs and educational resources.